Last night I happened to watch Days of Wine and Roses, a Jack Lemmon-Lee Remick movie from 1962 that, perhaps because of the overexposed theme song, I had resisted for years. My mistake. It is a powerful, compelling story of an alcoholic couple whose refusal to acknowledge their alcoholism destroys their relationship. For a movie made nearly 50 years ago, it remains remarkably relevant, not just for its treatment of addiction, but also, surprisingly, for its critique of corporate marketing and PR. It’s no coincidence that Jack Lemmon’s character works in public relations. In his career, as in his personal life, he papers over the ugly truth until it’s too late. 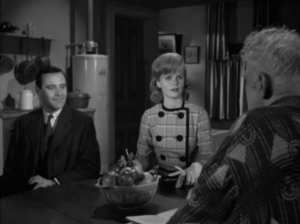 The parallel becomes clear when Lee Remick takes Lemmon to introduce him to her father, played by Charles Bickford. When Bickford asks what Lemmon does for a living, things go rapidly downhill. Watching the exchange, it’s hard not to think of British Petroleum’s disastrous handling of the Gulf oil spill. Charles Bickford: What kind of work you do? Jack Lemmon: Um, uh, public relations. Lee Remick: Uh, you know, Daddy, um, well, uh, it’s hard to explain. JL: Well, err, I, I suppose you might say my job is, uh, to sort of help my client, uh, create a public image, uh, by—well, for an example, um, let’s say my client—Corporation X!—uh, does some good. Or something of, uh, benefit to the public, or something that could conceivably be conceived as, uh …. benefit to the uh… Well, my job is to see that the public, uh, knows it. CB: And what if this X Corporation does something bad? JL: Well . . . . [chuckles nervously] Well, theoretically they don’t . . . um, theoretically. Well, uh, part of my job is to, uh, help my client to, um, to think of ways to operate, uh, in a way that the public would, you know, approve. CB: But if your X Corporation makes a mistake, and the thing turns out bad? LR: It’s terrifically complicated, Daddy. CB: I don’t understand that kind of work. The movie holds out hope for alcoholics through the intercession of Alcoholics Anonymous. It offers no similar shot at redemption for corporate PR. This was, after all, the 1960s, the zenith of corporate marketing and advertising (think Mad Men). PR was about controlling the message, not addressing the truth. As the movie shows, and as, one hopes, corporations are learning, the failure to face up to the truth and acknowledge your mistakes only compounds and delays your day of reckoning. This entry was posted in Content Marketing, Ethics, Social Media and tagged Content Marketing, control, Ethics, Social Media, transparency by John Bethune. Bookmark the permalink.